Back for one last quick post before the arrival of our little lady in (hopefully) the next few days. 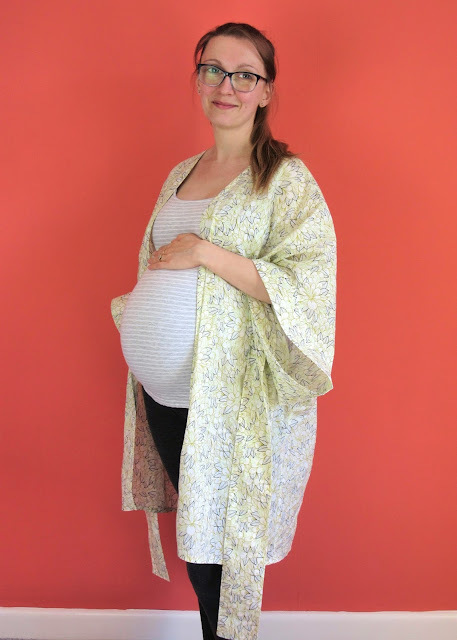 I've heard from friends that the postnatal ward will likely be pretty warm and as I couldn't find a lightweight dressing gown I liked which wasn't quite expensive, naturally I decided to dive into the stash and make one! 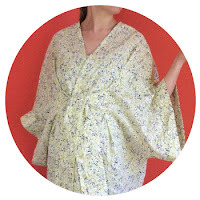 Enter the 'Almada' robe by Seamwork. 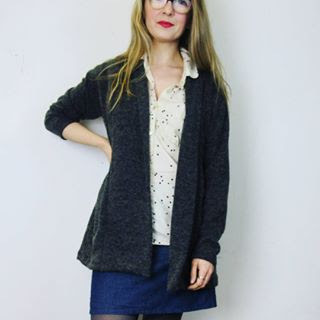 I joined Seamwork quite some time ago. The designs can be a little hit and miss for my current needs and personal taste, plus with a changing body I've been reluctant to spend time on makes for myself so I've amounted quite the number of pattern tokens. 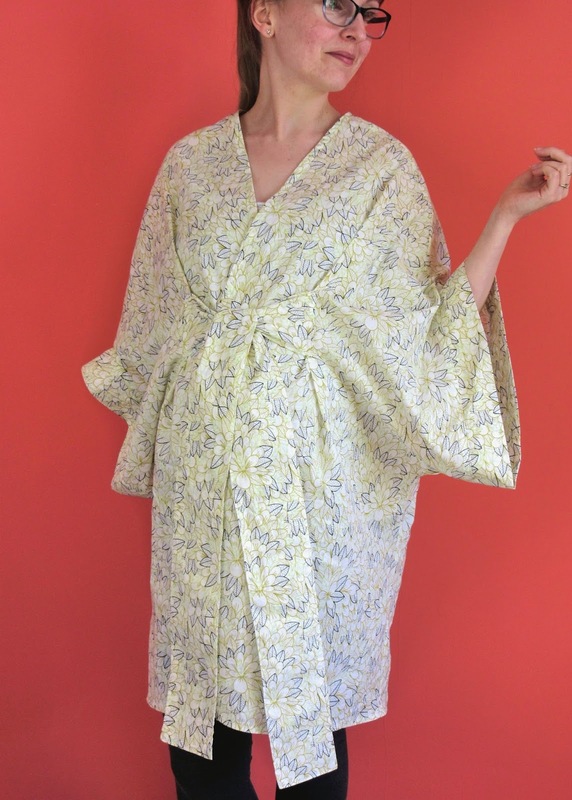 I was delighted to see that they have introduced an account freeze option on top of the possibility to redeem more tokens for Colette branded patterns meaning I can hold off on a few choice makes until my shape stabilises without accruing more tokens than I can possibly utilise! Hurrah. So fabric for this one is a crisp organic 'Blomma' cotton voile from Lisa Congdon's 'Kindred' collection for Cloud9 which I kept after the store close. 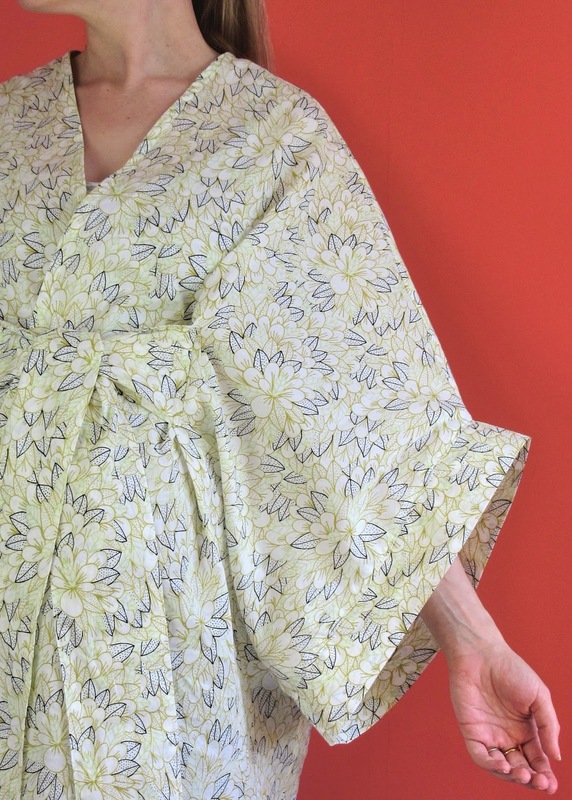 The outcome is slightly different than if I had used something with more drape, a viscose or double gauze perhaps, but it's just what I was after -light and breezy. Construction wise I didn't veer too far from the path. I sized up based on my new bust measurement and attached the ties a good 3" or so higher as the indicated positioning hit right on the fullest part of my (very) pregnant belly and looked a hot mess. A few other little additions were stay stitching the neckline to avoid it stretching out as I attached the bias binding (which I understitched before turning), adding a hanging loop and adding 2 inches to the hem for a little more coverage. One aspect of the pattern I wasn't so keen on is the somewhat strange angle of the sleeve bands when the arms are lowered. It's not a big deal and I knew to expect this from the pattern samples. I pondered adding shaping to the band to reduce the angle at that point -in all honesty I couldn't be bothered so accepted it as is and ploughed on. It came together quickly and easily and is just what I wanted -a crisp and cool cover up for my hospital bag that is easy fitting so will hopefully continue to see plenty of wear in the coming summer months as my belly subsides. I'm thinking some Carolyn Pyjamas to match would be lovely once my body shape settles. Due date this Saturday ...see you on the other side!! Oh this is gorgeous! I love the fabric so much, I’m sure it’ll be wonderful to wear. Good luck!